The lack of diversity in the tech industry has been a widely covered issue for years now. 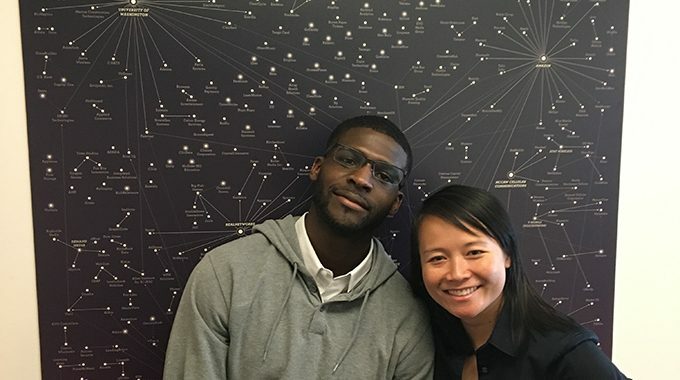 For the first time ever, Seattle Startup Week (Nov. 14-18) is having a Diversity and Inclusion category, or “track.” Julie Pham, head of community engagement and marketing at WTIA, and Andrew McGee, executive director of the Greater Foundation, are the track co-captains. Julie started designing the track in late August and came up with the idea to hold a series of “Real Talks,” candid conversations about race and gender issues in tech. She realized she needed a co-captain and after I introduced her to Andrew, they hit it off and partnered up. Julie Pham (JP): I am so bored of listening to panels with corporate heads of Diversity and Inclusion talking about the need for diversity and inclusion, but nothing really happens. I wanted to move away from generalities to sharing specific lived experiences so that we can understand where we’re coming from. JP: What do you think about the culture here? Being essentially a native Seattleite, I think we’re culturally very passive and extremely liberal and people are often apologetic about talking about difference because to talk about difference seems…impolite. AM: I can definitely see the liberal and passive culture that reinforces political correctness. I also see a very diverse population from downtown to south Seattle. With the tech industry not reflecting the richness of Seattle’s diversity, I believe we have a real opportunity to be the city that is seen as an example of how to successfully foster equity, diversity, and inclusion in tech. As innovative and progressive as Seattle is, all that’s needed is real passion and intention with this topic. What surprises me the most is that there are too many of us unfamiliar with the minority community right down the street from downtown. I’m guilty of that too. My office is at Galvanize in Pioneer Square and I had never spent time in the International District, which is only five blocks away, until we started working together. It’s on us to change that. AM: Yes, and when I first saw your proposal, I just didn’t think having an all-white panel discussing their privilege would be very encouraging to attendees or speakers. We all know that white privilege is a real thing; however, it may be more beneficial to hear from different levels of privilege within the system of privilege. Once we’ve identified the fundamental problems as a system – that’s more complex than just racism or discrimination – then we can understand how to maneuver within it. JP: Yes, I’m glad we changed it. Now we have a white man, a white woman, and a South Asian male CEO on that panel. They represent groups that have privilege in the tech industry and their privilege differs. It’s been really interesting talking through privilege with all of our speakers and witnessing them reflect on their own privilege too. And I appreciate you and I can talk about our different experiences openly. I’ve become more aware of my privilege as an Asian. AM: Yes! The same goes for me. I wasn’t embarrassed to tell you that story of how I recently referred to an Asian American guy as “Chinese” to another friend and then caught myself and apologized because I didn’t actually know if that Asian American guy was Chinese. Success to me looks like people going back to their companies and challenging the status quo. I hope to see people inspired to be intentional after the event. I would love to see new friendships forged, similarly to yours and mine. This journey has already inspired us to learn more about each other. Post event, I’d love to hear of stories similar to the one I’m now able to share about you giving me the tour of the International District, showing me your “hood,” and giving me the opportunity to learn more about Asian culture. That made an impression on me and created more curiosity and eagerness to learn more about Vietnamese culture and generally broaden my perspective of different cultures.